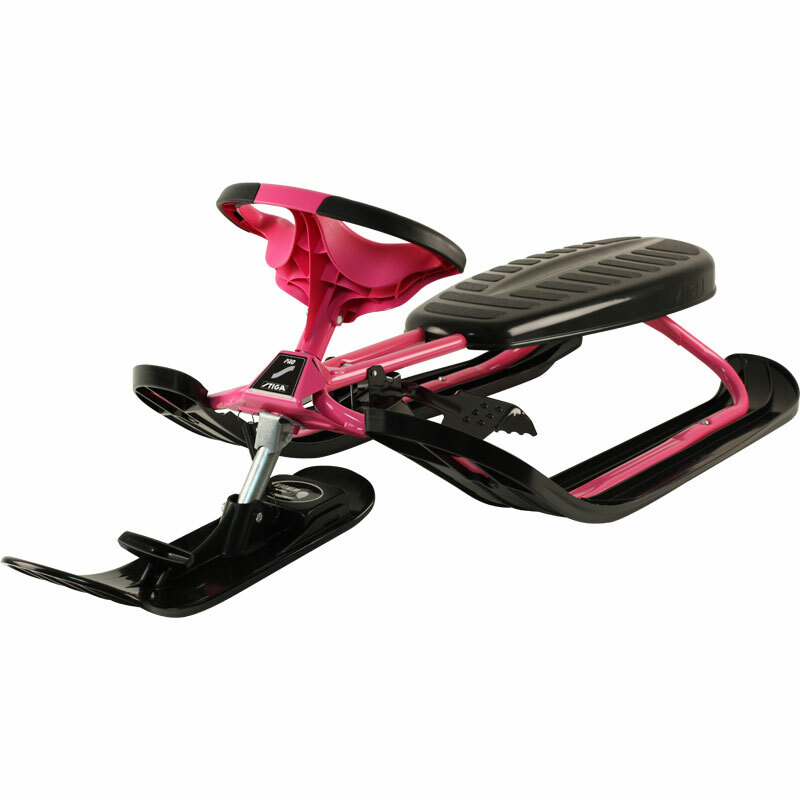 Stiga ® Snowracer Pink Pro. Universal model in the SnowRacer, the new shape of the front skis "Twin Type", created on the basis of the latest achievements of engineering thought has a curved edge. Compared with the conventional straight skis new skis glide faster, thus improving maneuverability. Now the barriers do not prevent movement. The new design makes it possible to ski to roll back. Curved edges allow unobstructed turn back in and do not crash into the layers of snow. 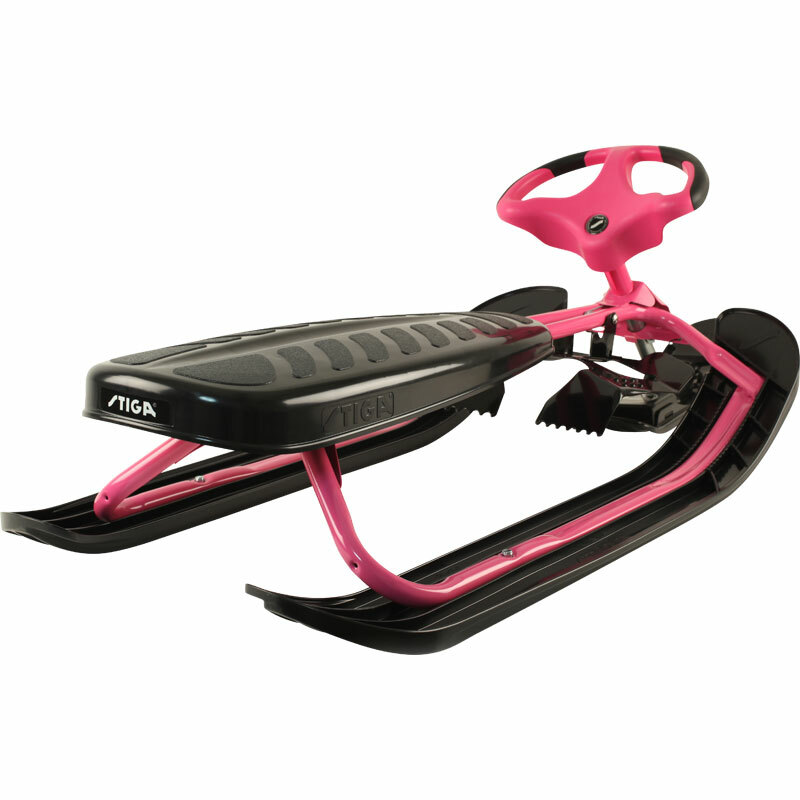 Universal model in the SnowRacer range. The new shape of the front skis "Twin Type", created on the basis of the latest achievements of engineering thought has a curved edge. Compared with the conventional straight skis new skis glide faster, thus improving maneuverability. Now the barriers do not prevent movement. The new design makes it possible to ski to roll back. Curved edges allow unobstructed turn back in and do not crash into the layers of snow. Steering wheel is made of non-slip material for added safety gripping hands, even with gloves and mittens. The model is equipped with a towing unit, with which you can easily take over a snow-cats or snow-cats with a child. It is made of durable rope and, with no need for it, easily automatically wound into a coil that does not give him a dirty, torn and stop skating. Skiing snow-cats are made of heavy-duty plastic frost, and the seat has a non-slip surface. Snow-cats is designed to withstand heavy loads. Drops and bumps snow-cats, do not violate its integrity, as its frame is made of solid steel. Foot brake is made of painted steel, which will allow it to serve a long time. Dimensions: 120 x 50 x 38cm.